Sign up for Broadjam today to follow David A, and be notified when they upload new stuff or update their news! You're invited to experience the music of the heavens. 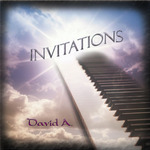 "Invitations" is a collection of God-given melodies brought to earth by David A. Beautiful, haunting music invites you to celebrate love and life.